I very much appreciate you looking at these and giving me some background information if you can! Here are the pictures of the two ceramic busts. I have not had these appraised, and am trying to get some idea of value for insurance purposes...and whether to leave them out on display in my home...vulnerable for some kid to knock them over! I have just recently acquired these at an estate auction. This set was sold together as one lot of 300+ lots sold at the auction, all pieces of which came from the estate of a fairly well known art collector. However, the auction house said very little about these at the sale...which in retrospect was really odd, given the nature of them and their potential value. 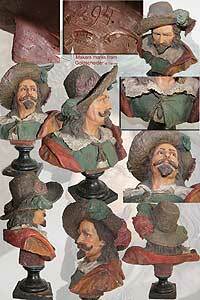 Basically, they had so much to sell that they just sold them as old ceramic busts and called them Lordship and Lady . Is that a proper name for them given by Goldscheider, or were they portrait busts of somebody? Bottom line...I purchased them just because I liked them, not knowing anything about the potential value of the set or what they were. Once in awhile at an auction, you find a diamond among the pebbles! 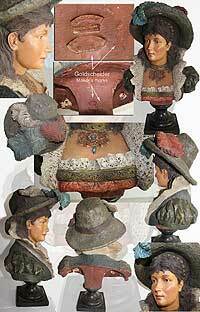 When I started looking around and found that they were a Goldscheider product, I obviously was excited to learn about them, especially since they are so old. They appear to be authentic, with proper markings. Both busts are clearly marked 294 - I presume that is eaither for set #294 of ??? sets produced - or is that a date mark for February, 1894? I can clearly read the FGOLDSCHEIDER stamp, WIEN stamp, and the GESCHUTZT copyright mark. On the female, the best I can make out is BESETZLICH, but I don't know what that word means nor the significance of that particular marking. It seems to be the same marking on the back of the male bust, but it is not nearly as clear. Since they are marked WIEN, they are clearly post-1885, but other than that, I can find very little about these pieces. It appears they are pre-1900. Any help you could give would be very much appreciated. Overall, the set is in very good shape for being ceramic and so old. The bases are wood and worm-eaten (luckily, the worms didn't like the ceramic) and there are several small chips, especially on the face of the "Lord". Should I attempt to do any repairs to small chips, or is it better to leave them as-is? There are no fractures nor any kind of previous repairs, as far as I can tell. The two composite images below are large and open in a new window...all the pictures below these are a slideshow of the images used. Again, THANK YOU so much for any insight, background, and opinions as to value 9 I wish to insure them) you might be able to provide me concerning this beautiful set made and sold by your family many long years ago!